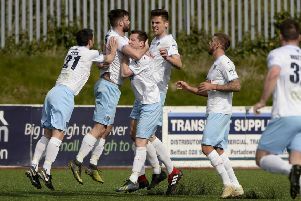 Wakehurst manager Paul Muir says his players are giving everything they have in their attempts to climb clear from the foot of the NIFL Championship Two table. The Ballymena men saw another precious point slip from their grasp on Saturday as they lost 1-0 to a late Newington YC goal at Seaview. “I know it sounds clichéd, however I genuinely couldn’t have asked the team for any more than they gave me,” said Muir. “I have a team of players I trust to give me every ounce that they have. With regular goalkeeper Marc Maybin unavailable due to a family wedding, Macauley Cairns took his place between the posts, while club captain George Young made his return from a long knee injury lay-off in the unfamiliar position of centre-back. “With poor goals against us recently, we worked hard in training all week on a pressing game and I asked the players to apply themselves from the first to the 95th minute and that is exactly what they gave us and more. “We got in Newington’s faces from the first whistle and had early claims for a penalty turned down after a challenge on Nigel Turner. “Unfortunately we were dealt a killer blow five minutes from time when Newington scrambled in the winner from a corner,” added Muir. Wakehurst travel to Banbridge Town this Saturday.